In the midst of the (very rewarding) experience of working on the prompt for week 2 of #moocmooc (are you ready for it? here is the link), Jesse shared this article with me, entitled “7 Lies We Need to Stop Telling About Muslim Women Wearing Headscarves”. I’ve been wanting to blog about this topic for a while now, and one of this week’s possible activities is to add a cultural angle on feminism (err yes, I co-authored that). So my first post is about the headscarf. Curious? Just keep in mind these are just my own views. I’m not a religious scholar (nor do I particularly care if what I say here contradicts what religious scholars say, since most of them are men or following the interpretations of men anyway). I’m just stating my own beliefs, which include a belief that the Quran, like any text, is interpretable in diff ways from diff perspectives and diff contexts; i also believe knowledge of the wider context of Quran and Islam helps contextualize parts of it, but this is really complicated to describe in a blogpost. Suffice to say that the idea of interpreting the Quran in modern contexts is normal Islamic practice, and that diverse interpretations are acceptable to quite a big extent). This won’t end up being directly about feminism in Islam, but it’s a post that I’ve needed to write for a while now. If you’re in a rush, jump to the bottom bullets under “Quick notes”. And can I just say i think the focus on how women dress is overrated? But i do understand how it has been politicized and so on, and that hijab is a symbol that carries social meaning. Before I ever started blogging, I wrote an article called Unveiling Prejudice, about how it felt for me to have a woman in my class who covered her face (not just her hair), which was an exotic experience for me at the time. I was just recently talking to a male colleague who had taught her and we were talking about her enthusiasm and how rewarding it was teaching her, and also how we were actually able to tell her reactions and emotional responses in class even though we could not see her face (no, really). But this article isn’t about niqab (covering the face); it is about hijab (covering the hair, like I do, and have done since I was around 20) which is more common in Egypt. So the article about “lies” RE: headscarves – most of what is in it fits with my experience. But I’d like to augment it and also nuance it a little. That will take time and space. So here goes part 1. The religious conservatism assumption might be because nuns and Orthodox Jews also cover their hair? I see women in Egyptian churches sometimes cover hair during service? I have heard that historically in the West women were supposed to wear hats in public? Women (Muslim ones) wear the headscarf for different reasons, and even the Quran gives different reasons for covering up. So let me give a few details here. First, there are some areas in places like Egypt (especially the less educated classes) and the Gulf (not class based) where covering up is a cultural thing, regardless of how religious you are. You’ll also notice differences in how people cover up, and whether they do it consistently or not (e.g. some Pakistani women I know often cover up but show parts of their hair; this is frowned upon in Egypt, even though it is done). For women who cover up for cultural reasons, you’ll find some who take off the headscarf depending on location, or when they leave the country. Some Egyptian women (especially of less educated classes) wear a headscarf but do not dress particularly modestly (although modesty is relative, of course!) because they aren’t really wearing it for religion or modesty in the first place. There are also times when hijab is “trending” and times it is not; I started wearing it at the turn of the millennium; it started trending soon after (i am not part of that trend coz i had wanted to wear it since i was 13; the trend just helped make it easier to live with it, find good clothes, find others who looked similar and supported me); but now, after the revolution, the trend is almost reversed – many women are taking it off (it’s really quite phenomenal – reminds me a little of the historical feminist movement in Egypt when women took off their cultural veils in symbolic rebellion; this one might relate to not wanting to be affiliated with the ousted Muslim Brotherhood,or some other rebellion against superficial religious practices). When many women started wearing it, and I talked to them, each had her own reasons for doing it; some were genuinely spiritual; some were cultural; and some were deceptive, like women wearing it in order to appear more religiously conservative e.g. to snag a husband more easily (this strikes my mom a funny coz she always thought men would prefer to marry someone knowing what she looked like… but anyway). Second, there are disagreements on whether it is religiously required. OK, the majority of scholars believe it’s required. I don’t 🙂 (this belief by turns offends and baffles some people, be warned). The verses in the Quran that refer to covering the head or wearing long clothes are not completely airtight (in my view) and there are Hadith (sayings of the prophet) that range from requiring headscarves to weaker ones (“weaker” meaning the sources are not solid, and therefore not commonly used as evidence) that seem to imply covering the face. The consensus amongst most Muslim scholars is that covering the hair is the “thing”. I’m not so sure that something required would be left so vague in the Quran (primary source of Islamic teachings) – unlike more fundamental requirements like praying 5 times a day, fasting Ramadan, paying alms, and performing the Hajj/pilgrimage. Those are very clear, repeated often, and put together (with the shahada, or stating the belief in one God with Muhammad as his messenger). However, no one disagrees that the covering of all but face and hands is the dresscode for prayer and hajj, so there is that. Just before this verse, is another verse telling believing men to also “lower their gaze and guard their modesty”. This is really important because the “burden” is not on women. But my personal experience, before wearing it, was that it’s really difficult for men to lower their gazes from things like cleavage (notice the verse is about lowering the veil over the bosom, not about wearing the veil itself; as if the veil is already assumed to be there, maybe for cultural reasons?). Just be a woman, displaying lots of cleavage, and watch a man talk directly at your chest for 15 minutes. I still remember how much I hated that. Now headscarf is about the hair, you say, not the cleavage. True. You can be pretty conservatively-dressed without covering your hair. I agree. And I think that’s modest enough, actually,and contextual 🙂 cleavage on the beach is not the same as cleavage in church or in the workplace; likewise, Egyptian women who don’t wear a veil dress more conservatively when visiting slum areas or riding the underground than they would at a party with close friends). I don’t think women *need* to cover their hair. It does, though, say in the verse something about hiding “beauty and ornaments”. Again, even if someone has beautiful hair that is really attractive and they want to be modest, they could pull it up in a tight bun, not cover it. I agree again. I just didn’t like my guy friends pulling on my ponytail, and “please don’t do that” wasn’t working for me at the time. The historical reasons for the whole known/recognized and abused part is murky, to me, but something along the lines of women of stature being confused with slave-women (please don’t get me started on this). But the key thing to me about interpreting the Quran is that it needs to make sense to contemporary society, regardless of the history. Otherwise, there’d be no reason to keep reading it over and over again. Really, if Freire, Shakespeare, the Bible or the Quran had no significance to us today, we wouldn’t keep reading them, right? I wouldn’t, anyway. The fact that a lot of details are left out of the Quran is a good sign to me because it gives space for each person to recontextualize it and transfer to their own context. That’s my view, anyway. But anyway – this being known and not abused thing is really interesting because there was research done on sexual harassment in the streets of Cairo, and apparently women who cover their hair are not harassed less. To be honest, it’s not why I wore it, but I’ve definitely been harassed less since I started wearing it. I’ve been harassed, but much less frequently. But that’s the research anyway. It might actually be that more women of lower social classes cover their hair, and that more harassment occurs in those kinds of areas. Although I’ve gone to such areas and not been harassed. Maybe you can tell by how I’m otherwise dressed, the way I carry myself, or err the car and the driver 😉 so men don’t often harass me. But back to recognition. One of the most interesting things is wearing hijab and walking in the street in the West. Every other woman wearing it recognizes you as a Muslim, and we say “Salamu Alaikum” (Muslim men don’t have that privilege; my husband was often mistaken for Hispanic when we lived in Houston because he looks quite a bit like Alberto Gonzalez). This transfers online as well. I remember first noticing Rusul Al Rubail on a #digped discussion or something, and immediately knowing she’s a “sister” from our profile pictures. That’s almost an automatic bond you get by sight. There’s a downside of course. And Rusul and I (also Jesse and I) have been discussing this offline, separately, in things we’re co-authoring, about choices to make some aspects of our identity visible and the implications. The downside is that some people will see the headscarf and make assumptions about you. It can feed into all kinds of biases, from Islamophobia, to stereotypes to downright rudeness or even to dismissing ignoring you completely. It happens offline, of course, but also online, and Rusul has her own stories to share. (note, this downside explains also why religious scholars said women could take off the hijab after 9/11 so they do not get harmed). 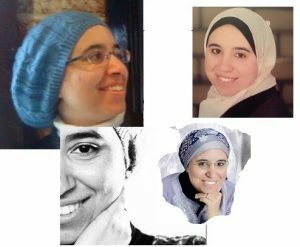 In my gravatar and disqus profile i use a half-face image where i am wearing a cap, so you can’t tell i am veiled.i do it intentionally because they’re not “my space” like the blog itself or twitter and i don’t want my veil to distract ppl from what i have to say. There’s a funky side, too, in that it creates an exotic effect… that can attract people to you, but you don’t really know if they’re attracted to your ideas, or to making them feel like more tolerant people accepting of diversity. I guess being Egyptian alone will do that, though. I realized while writing this that this post could go on forever. So I’m going to make a few quick points, and see what else others have to say (Rusul? I’ll link to a blogpost of yours if you write one, and we’ll get around to finalizing our collaborative post soon, too). I love that it identifies me as Muslim. It’s a little unfair to Islam and to me (as it sort of makes me an icon and representative which is not what I asked for, but there it is). I love that it helps me know another person is Muslim (this sounds silly, but it feels good when you’re in a country surrounded by people who look different from you to find someone who does look like you – regardless of whether you’ll actually ever become friends). I’m not a particularly conservative person; I’m actually mostly liberal (though not about everything; I sway on certain things all the time, discovering I am more or less liberal about them as I go and as I meet more people and live through experiences). This is a long story, so I’ll save that for another post. Someone once asked me to explain it. Not now, OK? Thanks for writing this piece, Maha. When I read that article, “7 Lies We Need to Stop Telling About Muslim Women Wearing Headscarves,” I was left wanting more nuance. The piece felt important, and I’m glad it’s being shared, however I also worried that it elided the very idiosyncratic relationships women have with headscarves. I love all the detail in your piece here (especially all the parentheticals, and in the way they reveal your own sometimes conflicted thinking). I am glad this conversation is sitting alongside our #moocmooc piece, and that we had other hard conversations in writing together. Feminism means, at least for me, a willingness to have those hard conversations. And a willingness to listen — and to fumble together through our thinking. Thank you so much for this post! I guess you could say that I’m one of the “curious” Westerners who ask questions and have had conversations and heard similar perspectives to the ones you have voiced. I have considered all the benefits you have mentioned to wearing hijab – there are actually quite a few, aren’t there, and have really wanted to try it – but obviously wouldn’t because I feel like it would be disrespectful (although that wouldn’t be my intention) and it just wouldn’t work on a non-Islamic Westerner in the US. And then of course there are all the unfortunate downsides you have also brought to light, which I have also seen. You have also reminded me to go back to my own reflection on the focus (obsession) on women’s clothing…will be thinking about that all morning. Thanks again for this frank and personal post. I hope you will continue to add to it. And a request for a future post? Would love to hear your perspective on the tangle of definitions of Westerner/Easterner (which I don’t hear much), and nation-based, racially-based, and religion-based identifiers…I stumbled over “non-Islamic Westerner in the US” in my prior comment…that would suggest that ‘Westerner” = “White” and I don’t know that that’s right or that I even agree with that. Would love to hear your thoughts some time on what all those words mean. I had a boss in the 90s who had started wearing the hijab when she got married. We used to talk a lot about why she had started wearing it (her choice, he husband had not wanted her to but she persuaded him that it was not going to make her be oppressed). Anyway, she made me very jealous by constantly pointing out that she did not have to spend ages doing her hair every day, while I did. Hi Maha, I am so happy you wrote this post. As you and I have discussed this before, mostly through private conversations, that I don’t feel comfortable discussing issues of race/religion on social media. So I admire your courage for speaking out about this tough topic. For me feminism is always about choice, and respect the female body. And have to echo Jesse’s thoughts is that it’s also about listening. I love your eloquent yet conversational style in writing. Simply beautiful. Again thanks for sharing and giving courage for others to speak up. Thanks Rusul, our conversations certainly inspired a lot of this, and I am looking forward to your blogpost and our paper! As someone living in the UK I found this a really stimulating piece. Here in Europe we have been exercised over the last few weeks on issues relating to freedom of speech/freedom of expression (following the Paris atrocities). The general arguments you are putting forward feed into my thinking on that issue. My own view is that unconditional freedom of expression is a nonsense. Clearly, we need to recognise and be sensitive to the beliefs and prejudices of others. Otherwise how can we possibly live together? So the point at issue is how to judge when offending other people is justified (and, of course, on what grounds it is justified). I like your discussion of ‘modesty’ because that seems to me to be a way of mediating – within your own cultural context – between a very ‘in your face’ freedom of expression line and a line which acknowledges the need to recognise and respect other faiths, beliefs, world views etc. It keeps the door open for discussion, argument, debate …. etc. So thank you, Maha, for adding to my ongoing thoughts on this subject! Thanks so much for sharing this, Maha. I read it a few days ago and have been thinking about it since. I’ve talked to women before who have stopped wearing a hijab and they’ve spoken of their decisions as a way to wrest control of their own (female) bodies back from the overt and more subtle forms of patriarchy their perceived as part of their religion. They also spoke of the backlash they faced from family and community as part of their decision. Hearing your story, which is in so many ways diametrically opposed to theirs, has given me another viewpoint. It’s also made it clear to me that, as a “westerner” and someone who is strongly non-religious, I likely do tend to draw conclusions based on such things, and that’s something I really do need to call myself out on. Hopefully we’ll run into each other at some conference some day ’cause I’d love to talk to you more about this type of stuff! “That is more suitable that they will be known and not be abused.” It might be that my male wiring rules my inability to regard women in revealing dress seriously. But is it an abuse of intelligence to be distracted or seemingly disrespectful when my inner teenager can’t stop gazing. But is also phony and a false representation of myself to say I’m not noticing. I don’t intend to imply I’m excusing my male weakness of gazing, only that this foolishness draws both parties to underestimation—maybe the worst thing we place on a person is to diminish but assumption by “looks”? A community where each “be known and not abused” by the belittling and separating power that should NOT represent is a strong community. It might be that women know from some men who are controlling that underestimation is the first tool of disrespect and abuse? Hi Scott, amazingly, when I first read this comment I was running around doing chores at home and thought you meant something along totally different lines (which just goes to show what speed reading while absent minded can do) – i *think* i understand you better, but not completely? Are you saying you recognize (especially young) male human nature, or that we underestimate men’s capacity for self-control? Or that women recognize that men respect them differently based on their looks? Of course, to be completely fair, covering my hair also gives an impression that might not be favorable in certain contexts – assumptions (by men and women alike) that i am closed-minded, or more conservative than i actually am. I can’t remember the exact context of a certain conversation, but it was a university event at a table with a few ppl i don’t know, and a woman said, “but of course you know that, you cover your hair” and i was like, “what kind of assumptions are you making about me because i cover my hair?”. I also remember my favorite uncle (who is unsupportive of hijab) when i first wore hijab telling me, “well now your relationships with guys is going to change” and i was like, “i’m not doing anything with my guy friends that i’m ashamed of; i’ll work and eat and walk and talk with them as i always have” and internally, i said, “sure, i won’t have a boyfriend, i’ve never gone out with any guy alone before, or if do, at least i’ll try not to hug him in public, but i’m still entitled to have feelings for a guy every now and then, and i don’t need to hide it”. Maha, I like the way you have expressed how covering your hair does not define what/how you think about things in life.. I have Muslim friends (India) who cover completely with burkha, and those who just wear a modest dress like I do (salwar khameez). I have found that, their covering up does not define how conservative their thinking is. Of course, I have been curious always to know (worried), if they were covering up because they were expected to. Thanks for sharing, Aparna. It’s interesting that you mention your curiosity; it’s difficult to judge when it would be offensive to ask someone about this and when not. I am more careful to NOT ask friends who have removed the veil, for fear of them thinking i am judging them or such. On the other hand, sometimes the way people ask me why i wear it can feel offensive, for example, someone once asked, “you know i respect your mind and ideas, but why do you wear it?” Which clearly implies that the way i dress does not suit my mind and ideas! But most of the time, from my experience, women are willing to talk about it to others they trust. Fewer people are willing to talk about it as openly as this blog, i guess, because it risks all kinds of backlash. This post, for me, could offend conservative Muslims and ultra-liberals of all kinds… Maybe they read it and hated it but chose not to respond. Maybe they have lashed out privately about it. Fortunately, most people who did talk to me were very supportive of it and understanding. Thanks again for taking the time to comment.